Shutting down Chinese industry for even one day can mean losing hundreds of millions of dollars, which is why you have to be impressed by Beijing’s latest move. Following a report that a counterfeit handbag was manufactured in Hangzhou, Chinese President Xi Jinping immediately sprung into action and shut down all industry nationwide until a full investigation could be completed. No matter what you think of China, you have to applaud this commitment to quality. According to sources, the world’s largest economy is working around the clock to remedy the situation as fast as possible, shutting down every factory, store, and major commercial hub in the country in order to understand circumstances surrounding a single counterfeit Gucci-brand purse that was found in Zhejiang Province yesterday afternoon. The Chinese government is also covering salaries and benefits for the nation’s workers during the shutdown, with an overwhelming majority of government officials voluntarily forgoing their salaries until the investigation is completed. 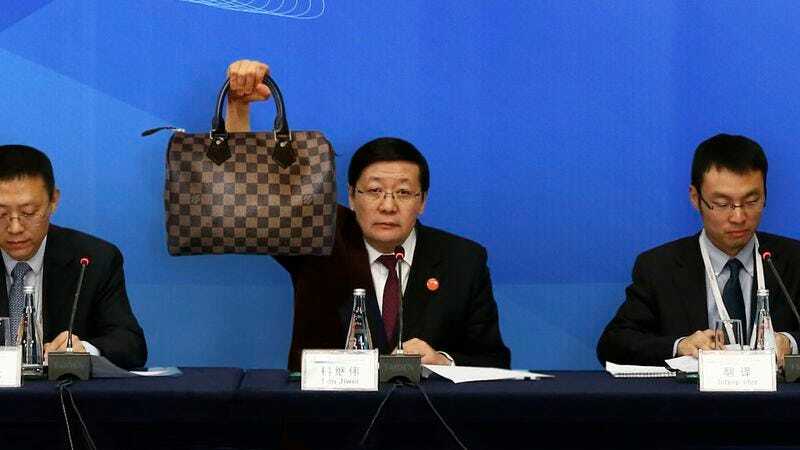 Unfortunately, there’s no telling how long the Chinese economy will be shut down while they investigate every aspect of the country’s manufacturing and seek to punish the counterfeit handbag perpetrators to the full extent of the law. That being said, hopefully China gets to the bottom of this soon so that we never have to worry about this again.